Download Mauricio Barberi's eBook, “How to Build Your Marketing Team for Growth,” to better understand how to scale your company. In this eBook, Mauricio shares his insights acquired over the course of nearly two decades of marketing and consulting experience. 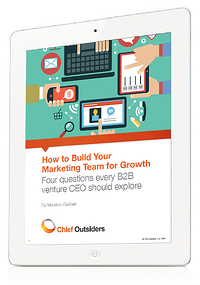 If you’re a business leader ready to build your first marketing team, then let's tackle the topic by exploring the four questions in this eBook. Feel free to contact Mauricio directly at MBarberi@ChiefOutsiders.com if you have any questions or want more information. What should my marketing organizational roadmap look like? How does the size and scope of the marketing organization at my company compare with those of companies in a similar stage of development? What marketing capabilities should be built in-house vs. outsourced? At what stage of growth should I consider investing in an experienced marketing leader? Question 1: What should my marketing organizational roadmap look like? After managing your marketing function as a collection of part-time roles, including a handful of contractors and—perhaps—a small agency executing project work, you may be ready to formalize and bring in-house key elements of the marketing function. This role typically provides field support (to an emerging sales and/or channel management organization); coordinates events, including third-party (e.g., trade shows) and company-hosted (e.g., breakfast series) events; and plans, manages, and measures basic outbound campaigns. As you begin building your sales organization, orchestrating feld programs and tactics that enhance sales productivity becomes a priority. Managing each event as an end-to-end campaign—with a planning, execution and follow-up stage—is essential for repeatable success. Your first field marketing / programs manager should be a strong project manager with well-honed planning skills; they should possess great attention to detail; and they should have the temperament to collaborate effectively with an expanding field organization. They should also be versed in promoting the company’s hosting of—or participation in—events. Today, all growth ventures, not just those offering a technology product or service, greatly benefit from a professionally managed digital presence. This is where all constituencies—investors, prospects, customers, partners, potential recruits, etc.—will first learn about what you do and why it matters. While many aspects of a company’s online footprint can be outsourced, establishing this role in-house early on—even if the scope of the role includes managing external agencies and/or contractors—will pay dividends. A digital marketing manager becomes the “owner” and hub of your company’s digital presence, from your website and presence on social media platforms, to blogging, email campaigns, and content syndication across digital channels. Content is still king. Developing and managing a content strategy has become increasingly important, as the level of “noise” pushed around through digital channels has increased exponentially. To distinguish themselves, early stage ventures need to tell memorable stories that define who they are, why they matter and how they’re going to help customers solve problems. An experienced content marketing professional will develop your content marketing strategy, which includes the creation of all content assets (e.g., brochures, position papers, case studies, info-graphics, videos, blogs, vlogs, website and social media content, etc.) as well as the optimal distribution of those assets through a variety of channels. Disciplined product marketing becomes a priority when a venture makes a deliberate decision to scale. Once growing the business relies on a team of professionals in sales and/or channel roles (and not just the founders who singlehandedly closed the frst few deals), packaging, positioning and differentiating the offering becomes critical. To achieve true scalability, the relatively new—and growing—sales team needs to learn how to articulate a clear, consistent and differentiated description of what the company offers and how it delivers value uniquely; this “documented story” is what product marketing delivers. Someone in your marketing team needs to “own” these activities. Enter the product marketing manager. Note that product marketing is an “outbound” role (i.e., outward facing messaging, positioning, content development, evangelism, customer advocacy). This is different from product management, which is an “inbound” role (i.e., focused on driving product development and release management). The world of media relations (also known as “PR”) has been turned on its head. Gone are the days when you pay a monthly retainer to a PR firm, which pitches your story to journalists in the hopes of driving media coverage. While this may still be a part of your PR program, today’s environment requires you to focus mostly on leveraging social media to amplify your message, engage with influencers, and shape the dialogue in your marketplace. Managing industry analyst relations, on the other hand, still requires “old school” planning and tactics. If media influencers and industry analysts play an important role in shaping how your target buyers think about solution providers, dedicating a resource to plan and manage media and analyst relations becomes essential. They will develop and orchestrate an ongoing (persistent) program to influence media outlets and analysts and, in doing so, drive the desired exposure and coverage. Identifying and engaging with key influencers in the company’s ecosystem—bloggers, speakers, researchers, reporters, etc. The proliferation of “front office” productivity tools and applications (e.g., CRM, marketing automation, content management systems, web analytics, social media monitoring, blog syndication, ad-tech, etc.) can be overwhelming, especially for small companies. Which business processes should I enable? What tools should I consider? How much functionality should I configure? How much integration between tools is required? As modern marketers, we try to stay current with all new developments. But just staying current is not enough. Once your venture begins to scale its sales and multi-channel marketing programs, having a dedicated resource to be the steward of front office processes, tools/applications and best practices becomes necessary. These infrastructure components will help executive management, marketing and sales learn from deployed tactics and optimize their efforts going forward. I have chosen the term tele-prospecting deliberately. This function, also known as inside sales, tele-marketing or business development, should focus on qualifying marketing-generated leads before they are handed of to sales. The person (or team) in this role may also spend some of their time cold calling to uncover new opportunities, driving registrations at company sponsored/ hosted events (e.g., webinars) and cleaning up/augmenting contact lists. Their primary role should be the qualification of “inquiries” generated through marketing programs and campaigns. In effect, tele-prospecting becomes the linchpin between marketing and sales. The nature of your offering (e.g., discrete products vs. custom solutions vs. services, etc. ), and the scope of your sales team’s responsibilities (uncovering, qualifying and/or developing opportunities), will determine if a tele-prospecting (or similar) capability should be deployed. If outside sales bandwidth, skills or costs are getting in the way of qualifying opportunities prior to dedicated pursuit, a teleprospecting resource (or team) may be a wise investment. Many small ventures work with an external firm, which gives them on-demand bandwidth flexibility. Others build a team in-house, giving them more control to drive predictable outcomes. Both models can work, and should be considered when the time is right to deploy this important capability. The depth and breadth of your marketing talent abroad will depend on the extent to which your positioning, messaging and packaging need to be tailored to the needs and expectations of those overseas markets. As your venture begins pursuing opportunities beyond your home market, it becomes essential to deploy a marketing presence to support field teams in those international geographies. Hiring a local marketing “generalist,” with skills that include field/programs management, content marketing and PR, would be a logical, cost-effective starting point to help establish a beachhead in a new market. Question 2: How does the size and scope of my marketing organization compare with companies in a similar stage of development? A B2B growth venture with $3 to 10 million in annual revenue and a few dozen employees should consider putting in place an in-house marketing team of 2-3 full time resources. Headcount will represent the greatest proportion of total marketing cost. However, the size of the discretionary (non-headcount) budget is where the greatest variability between companies exists, with discretionary budgets ranging from 25% (conservative) to 200% (aggressive) of the fully loaded headcount cost. As your venture’s revenues move north of $10 million toward the $25 million milestone, and the marketing team grows from 3 to 5+ full-time professionals, which typically focus on field marketing, programs management, digital marketing and content marketing, a single point of accountability for the group becomes essential. This is typically when a senior team member may get promoted to head the group or a junior leader is recruited from the outside. Note that the group “team leader” can be one of the sub-function specialists if they have a broader set of marketing skills and experience managing and coaching teams. This matters not only because of the increasing emphasis placed on the professional maturity, resilience and confidence that comes with several years of experience, but also because it impacts the leader’s ability to recruit, guide and retain a strong team and to establish productive, long-term relationships with other functional heads. As the company moves from mature startup to sustained growth, the marketing sub-function that typically represents the next step in team expansion is product marketing, especially when your company is marketing and selling a complex offering or a portfolio of products and services. In addition, as the footprint of tools and platforms to enable increasingly complex marketing and sales processes increases in size, sophistication and depth of integration, a dedicated marketing and sales operations manager may be justified. This resource should be accountable for supporting the full “front office” (marketing, sales, channels). As an organization approaches $50 million in annual revenue, most—if not all—of the marketing roles described in Question 1 should be in place, with some roles represented by more than one person. In addition, the “expanded” team will likely include agencies and/or contractors that may focus on creative/design work, PR and market research. Question 3: What marketing capabilities should be built in-house vs. outsourced? With a few notable exceptions (e.g., product marketing), many marketing sub-functions can be successfully outsourced. As an area with critical strategic value, however, marketing should build in-house the sub-functions that create, leverage and expand knowledge and capabilities unique to the company. The commonly outsourced functions listed below are (sometimes) brought in-house as a company matures and can afford more specialization (and sophistication). A more cost-effective approach may be to hire a single digital generalist who orchestrates the efforts of several outsourced digital specialists (individual contractors or agency). One of the success factors of a media relations program is the ability to influence—over time—the relevant creators and distributors of content. While employing social media facilitates content syndication, it does not guarantee shaping the dialogue of key influencers. To boost the efficiency of a small sales team, emerging growth companies often employ “appointment setters,” who tee up initial discussions for individual sales resources. There are hundreds of companies of all sizes that provide these services. To start fast, companies often outsource prospecting. As the role of this function matures from appointment setters to lead qualifiers, and as the size and specialization of the field organization increase, companies move to more sophisticated service providers, or bring the function in-house. Question 4: At what stage of growth should I consider investing in an experienced marketing leader? Of all the questions explored here, this one seems to cause the most consternation with CEOs of growth ventures. In nearly 20 years of working with small and mid-sized growth companies, many of them in the tech space, I have observed a broad range of approaches and outcomes. Missteps in hiring marketing leadership range from early stage startups that recruit a full-time, experienced CMO (overkill!) to established middle market companies that operate for years with no experienced marketing leadership. Organizations that wait too long often miss opportunities to build a scalable front office that delivers consistent growth. While there is no single right model (or trigger point) for hiring an experienced marketing leader, the guidelines below summarize some of the key metrics that serve as thresholds for making this investment. These guidelines are especially important when your venture relies on a sales and/or channel effort to go to market. The CEOs of an increasing number of growth ventures are choosing to work—for a time—with a fractional (part-time) marketing chief, especially when they want the benefit of experienced leadership but cannot justify the cost of a full-time executive.